It took tremendous courage and determination to rebel against the British Crown. And perhaps our Founding Fathers – and us in turn – have a touch of casual alcoholism to thank for the foolhardiness that led to the founding of the United States of America. The part of the story you probably didn’t hear in your high school history class involves a lot of drink, so sit back, relax, pour one of your own and take in one of history’s greatest stories while you sip. Before modern science’s very recent discovery of microbiology, we had no idea why sometimes drinking water made us very sick or even killed us, and so we naturally assumed that water is bad for health. All we knew was that for some reason, drinking alcohol was far less likely to give us dysentery and cholera. (Now we know it’s because in the process of brewing and distilling, boiling the water kills harmful bacteria.) In the colonial era, you only drank water if you were too poor to afford alcoholic drinks. Everyday Americans regarded beer and cider as just another foodstuff. So it should come as no surprise that colonial Americans drank significantly more alcohol than do modern day Americans. Whereas an American in 2015 drinks an average two gallons of alcohol a year (7.5 liters), the average colonist drank a whopping seven gallons of alcohol per year (26.5 liters). With alcohol so central and essential to colonial life, it’s only to be expected the colonists – as lead by the great thinkers and drinkers of the time – would have become so outraged with the British over a repressive series of taxes. After the British won the Seven Years War against the French in 1763, the British Empire found themselves deeply in debt. Since a great deal of the war had been fought on American soil (what is known as the French and Indian War in most American textbooks), the British thought it only fair that the colonists should bear more of the war debt burden by paying more in taxes. Maybe so – if you let them have a vote in Parliament. But of course, as every American knows, we were not allowed representation, and the British proceeded with an infuriating series of taxes called the Townshend Acts. One particular colonial favorite, rum, was especially hard-hit by the new taxes. Sugar cane imported from the Caribbean was essential to the distillation of rum, and suddenly incredibly expensive. Naturally, Americans were up in arms (first figuratively, then literally), doing whatever they could to oppose the taxes and find a way around them. Enter patriot John Hancock. Before he put his pen to the Declaration of Independence to create the most famous signature of all time, he smuggled booze into the colonies to avoid British taxes. In 1768, a year after the Townshend Acts started trying to tell him how to run his business, British customs officials seized Hancock’s ship, defiantly named The Liberty, in Boston Harbor, accusing him of smuggling about 100,000 gallons of wine and Madeira (a wine fortified with rum), of which he was most certainly and proudly guilty. However, in true Bostonian fashion, angry colonists literally dragged the customs ship out of harbor to Boston Common, where they proceeded to burn it in a giant bonfire. The British retaliated by suing Hancock for unpaid taxes, in the amount of seven million in modern dollars. Is it any wonder he chose to rebel instead of pay up? 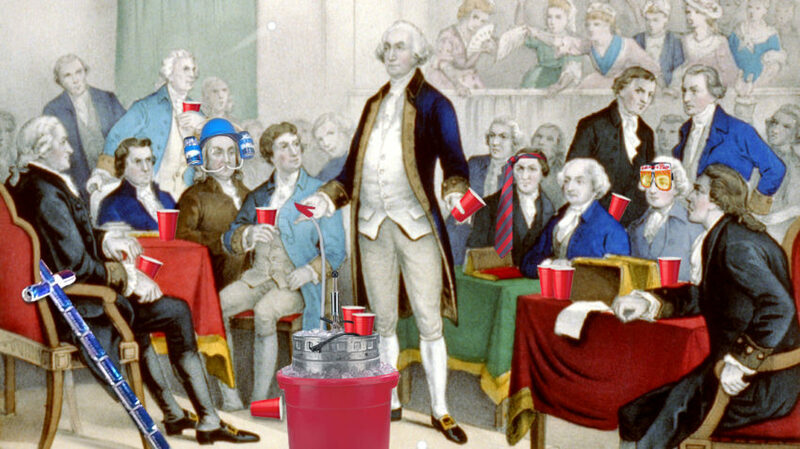 John Hancock wasn’t the only patriot to defend the colonists’ right to affordable booze. By 1773, the British had implemented another tax, this time on tea. 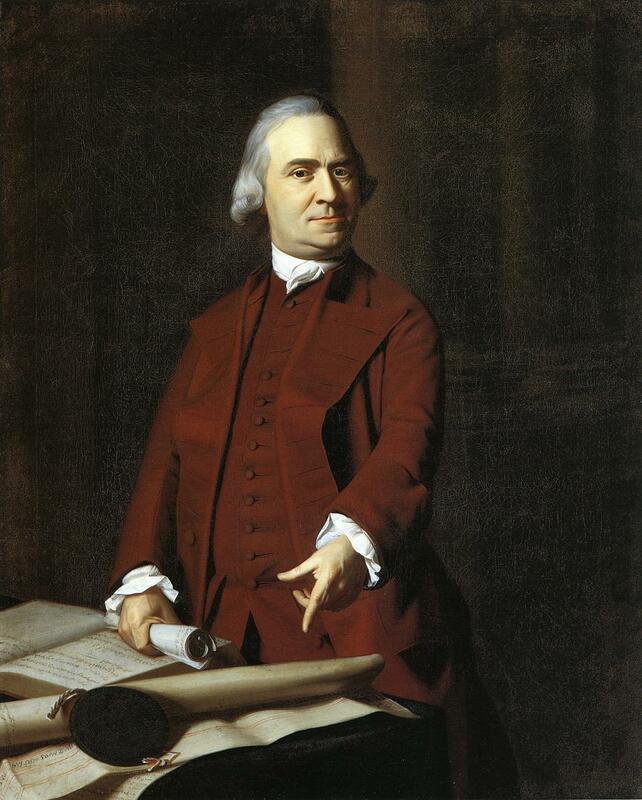 After a night of heated and rowdy drinking at the Green Dragon Tavern, Sam Adams led the Sons of Liberty to Boston Harbor where they famously plundered a recent shipment of tea, throwing it overboard into the ocean. Although the tea part of the story is well-known, the other part is less so – the British ship they ransacked contained more than just tea. Instead of destroying the valuable rum aboard, the Sons of Liberty first drank the rum, then they threw the King’s tea overboard. Well played, guys. We all know the famous story of Paul Revere’s 1775 midnight ride through slumbering, vulnerable New England towns. What you may not know is how much he consumed while on his journey. Before setting off, he downed some liquid courage in the form of two (undoubtedly smuggled) glasses of rum. He then rode from tavern to tavern, alerting revelers of the impending danger. In those days, taverns were the heart and souls of communities, making them the best way to spread urgent news. As Revere rode from tavern to tavern, he downed an ale to sustain him before continuing on his mission. Ethan Allen may be remembered best for his militia the Green Mountain Boys and the hell they gave British troops throughout Vermont – and eventually the whooping they gave the British at Fort Ticonderoga. Allen didn’t become such a seasoned fighter without a signature drink. Allen was a celebrated drinker (this might be history’s kind way of implying he had a drinking problem). His contemporaries said of him: “None spoke oftener, laughed louder, drank deeper than he who had been chief hero.” He called his favorite drink a “Stone Wall”, which was a potent combination of rum and cider. Try it for yourself it – it tastes like victory. Washington possessed many qualities that made him an exceptional leader, not least among them ensuring that his men had enough to drink. 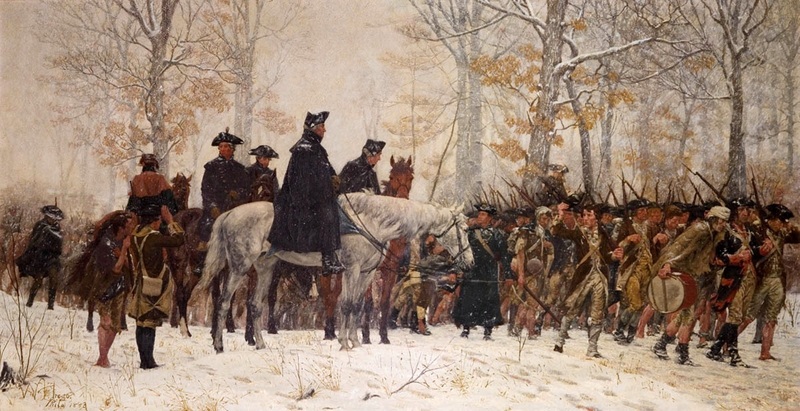 During the infamous winter the Continental Army spent at Valley Forge, Washington put his men first. When rations of rum arrived, the enlisted men received their share before the officers did. Now that’s a morale booster. By the time Washington served as the nation’s president, he fully grasped the political power alcohol could wield. While in office, he spent seven percent of his income on alcohol. When he left office, he threw a party with over 15,000 present-day dollars worth of drinks. After he left office and retired to his home at Mount Vernon, he continued his love affair with booze by operating one of the largest whiskey distilleries in the country. In the year he died, 1799, his distillery produced 11,000 gallons of the stuff. Before Washington could ascend to the presidency, the nation needed a governing document. The great drinkers of the time sat down with an ale or two and got to deliberating through the famous summer of 1787. By September 15, 1787, the delegates of the Constitutional Convention were finally ready to finish the document that would become the Constitution America still uses today. After everyone signed off on the document, they did what anyone would do – drink themselves into oblivion. According to the bar tab from the evening, the delegates drank 54 bottles of Madeira, 60 bottles of claret, 22 bottles of porter, 12 bottles of beer, 8 bottles of hard cider, 8 bottles of Old Stock (whiskey), and 7 large bowls of spiked punch large enough that, as one observer put it, “ducks could swim in them”. “[Dinner was] washed down with cider, weak or strong beer, then white wine…they keep drinking right through dessert, toward the end of which any ladies…leave the table and withdraw by themselves, leaving the men free to drink as much as they please, because the bottles then go the round continuously, each man pouring for himself. Toasts are drunk, cigars are lighted, [and] diners run to the corners of the room hunting night tables and vases which will enable them to hold a greater amount of liquor.” Stay classy, America. The nation’s most storied Founding Father, Benjamin Franklin, also endures as the most quotable. He famously declared, “Beer is living proof that God loves us and wants to see us happy.” He also brewed beers, distilled liquors and wrote The Drinker’s Dictionary, which contained 200 euphemisms for getting drunk, including classics like “piss’d in the brook”, “bowz’d”, “dagg’d”, and “he’s been too free with Sir John Strawberry”. With the evolution of modern morals, many of America’s classic and foundational drinking stories have fallen out of history curricula, but have no doubt: without the magical power of alcohol, America would be a very different country today, indeed. And when in doubt, it is always best to read these stories, while drinking a good ol’ American beverage.